Hi Clients and Friends……… Thought you might want to peruse a cool luxury New Zealand and Australia itinerary put together by one of our top partners in the area. The writer is a woman here in San Francisco who is the US representative and who I work closely with. Enjoy reading, and let me know if you have any questions and/or would like your own custom itinerary for yourself or for a group of friends. We also do pre-organized small luxury groups if you prefer traveling that way. My top recommendation is to visit these destinations separately. When clients combine Australia and New Zealand in one trip, they are truly just skimming the surface of what each country has to offer. My trip began with “The Red Heart of Australia.” Rising nearly 1,150 feet high from the desert plains, Uluru is Australia’s most recognizable natural icon, a 500 million year-old sandstone formation that is sacred to the Aṉangu, the Aboriginal people. Uluru was a magnificent place to start because of the palpable sense of spirituality in the land, the fabled light and the vastness of the views. The black night skies were so brilliant with stars I felt I could reach out and touch them. 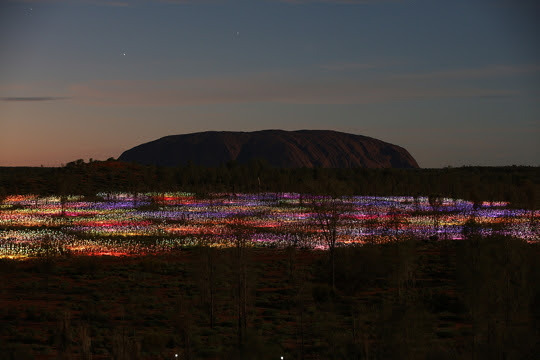 Another stroke of luck: the Field of Light art installation by Bruce Munro had just opened at Uluru. At night the landscape is lit by more than 50,000 slender stems topped with frosted-glass spheres in various hues. If clients are planning a trip to Australia before Field of Light closes at the end of March 2017, I highly recommend this magical experience. While there, the best place to stay is Longitude 131°, an eco-sensitive wilderness camp with 15 luxurious tents facing the World Heritage-listed Uluru-Kata Tjuta National Park and its fabled sunrises and sunsets. The view is incredible, and I couldn’t help but take a selfie from my deck. Longitude 131° offers so many ways to explore the landscape and delve into the foundations of Aṉangu culture, but one of my favorites is the Bush Tucker Tour. An Aboriginal host leads a walk through the countryside to identify bush foods, then guests prepare ingredients in the traditional manner. The Aboriginal people have such respect for the land, and provide an inspiring example of how we can restore our relationship to Mother Earth. Dinner is a four-course menu that changes daily and showcases the riches of Australian food and wine, be it under the canopy of the central Dune House or a billion stars at Table 131°. Later, an astronomer is your guide to the heavens. Staying in this luxury tented camp was a true highlight of my trip. From Uluru I flew north to the tropical rainforest in Queensland, where relaxation, wilderness, luxury, adventure, wildlife and Aboriginal culture all converge. Travelers can cruise with the crocs on the mighty Daintree River, tour the world’s oldest rainforest and snorkel the Great Barrier Reef, a 1240-mile collection of colourful coral reefs along the Queensland seaboard that makes for some of the most spectacular diving imaginable. I was particularly taken with Lizard Island Resort, set on a 2,500-acre National Park with 24 sandy beaches and a lagoon. It offers incredible access to diving, snorkeling right from the beach, inner and outer reef fishing and private beach picnics, along with all the luxury resort amenities you expect. Every time I looked up, I couldn’t believe the beauty of this place. Then it was down to vibrant, sunny Sydney, the nation’s capital in New South Wales. On past trips to Australia I had already enjoyed iconic experiences such as the Sydney Harbor Bridge climb, Sydney Opera House, Taronga Zoo, The Royal Botanic Garden and Bondi Beach. I had toured the wineries clustered in New South Wales and even traveled the Great Ocean Road, so Southern Crossings paired me with a local guide from My Detour who uncovered the hidden secrets of Sydney. My Detour is highly creative, offering themed tours that focus on food, music, Aboriginal spirituality and other areas of interest. I chose a custom tour that took me into Redfern, a culturally significant neighborhood that is the heart of Sydney’s indigenous community. Gentrification has brought great coffee, restaurants and shops to the area. I discovered a treasure-filled boutique owned by Brian, the New Zealander pictured above, and purchased a silk scarf and some beautiful china. Tourism to Australia and New Zealand is growing because they are among the safest countries to travel. New Zealand is the stunning landscape where “The Lord of the Rings” was filmed, and attracts ever more adventurers who want a place that is uncrowded, unspoiled and safe. Most Americans fly into Auckland on North Island and make their way south. Direct flights have recently expanded: American Airlines started its non-stop service from LAX in June, and United Airlines launched its non-stop service from SFO on July 1, 2016. Air New Zealand flies non-stop to Auckland from Los Angeles, San Francisco, Houston and Honolulu. Since I was coming from Australia, I flew into Queenstown on South Island and traveled north. My first stop was Blanket Bay Lodge, a luxury alpine lodge represented by Rebecca Recommends. Set on the northeastern corner of Lake Wakatipu and ringed by mountains, Blanket Bay is known for its stunning views. The combination of sky, mountain and lake is unlike anywhere else in the country, so I consider Blanket Bay a must for any trip to the South Island. Though it seems remote, I traveled less than an hour from the airport to reach Blanket Bay (a quick helicopter ride is just ten minutes) and was delighted to be welcomed by Tom Butler, Blanket Bay’s new general manager. Even though winter was coming (the seasons are reversed), we dined under the stars while a great fire roared, gazing at the still lake and ring of mountains. The five-course degustation menu changes nightly and features wines from nearby Central Otago. While staying at Blanket Bay I made time for horseback riding, but there are so many activities nearby, including golfing, fly-fishing, heli-skiing, hiking, jet-boating, kayaking, 4WD tours, art trails, winery tours and flight-seeing over the World Heritage Fiordland National Park and Milford Sound. It is truly the perfect home base for an adventurous holiday. From Queenstown I took a quick flight to Christchurch, an absolutely charming city that is rich in historic architecture, art galleries, parks and gardens, with the River Avon meandering through its heart. I stayed at Otahuna Lodge, an historic Victorian home transformed into a beautiful inn with seven luxurious suites. Otahuna Lodge is also known for its cuisine, and guests dine communally in an opulent formal Victorian dining room. During the winter months (now through September), executive chef Jimmy McIntyre offers a three-hour class that includes a harvesting visit to Otahuna’s organic gardens, menu planning, hands-on cooking class, and a four-course meal. From Christchurch I flew to North Island, where Hawke’s Bay is renowned as one of New Zealand’s richest agricultural areas. I stayed at The Farm at Cape Kidnappers, made time for another ride along the bay and enjoyed the area’s wineries, shopping and beautiful landscape. My next stop was Lake Taupo, the trout fishing capital of New Zealand. Its vast and beautiful waters drain into Huka Falls, which is New Zealand’s most-visited natural attraction. There I enjoyed the iconic and legendary Huka Lodge.